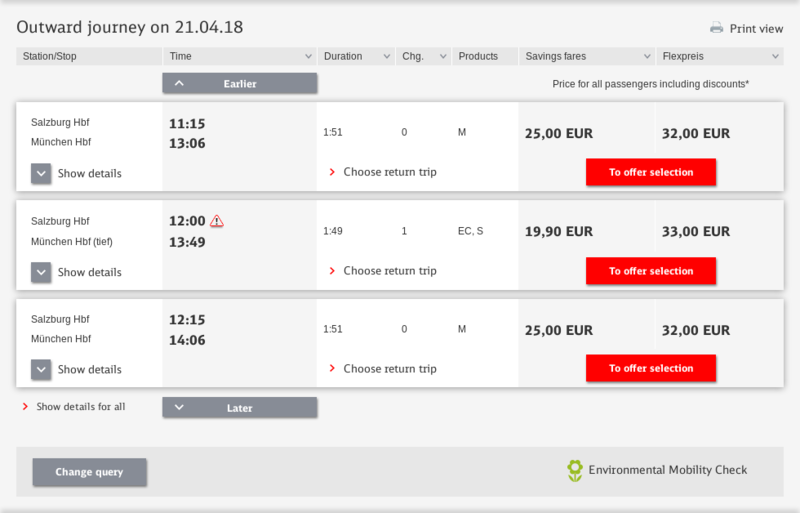 When I was searching for a train route between Salzburg and Munich on https://www.bahn.com/, a lot of the routes in the results had "M" in the product column (for instance, the first and the last row of the attached screenshot). What are those trains? They seem to fall under regional trains according to DB since it says a Bayern Ticket would cover them. The regional train services between Munich and Salzburg (via Rosenheim) are not provided by the (formerly federal) Deutsche Bahn, but by the private brand Meridian. The route was operated by Deutsche Bahn Regio until 2013, but Transdev won the bid to implement the public transport system for the Bayerische Eisenbahngesellschaft and is running the trains since then. The DB search does find them, but lists their train category as M (for Meridian) instead of the customary RB or RE. You can use a Bayern Ticket, but you can also purchase tickets directly from Meridian. There are separate ticket machines for them in the stations. I was tipped off by another weird train abbreviation, RJ. A quick search reveals that RJ stands for RailJet, an Austrian Railways train. So I went to their website and searched for the same route and, unsurprisingly, got the same timetable as in the screenshot in the question. But there was something more: an operator name. M seems to stand for Meridian, a German rail service according to Wikipedia. There are quite a lot of pictures of their trains on Wikimedia. Not the answer you're looking for? Browse other questions tagged trains deutsche-bahn or ask your own question.